Anne Marie Green and her business partner Ian Kelly have launched a range of school and sports bags to help improve the lives of the children of Ho Chi Minh city in Vietnam. 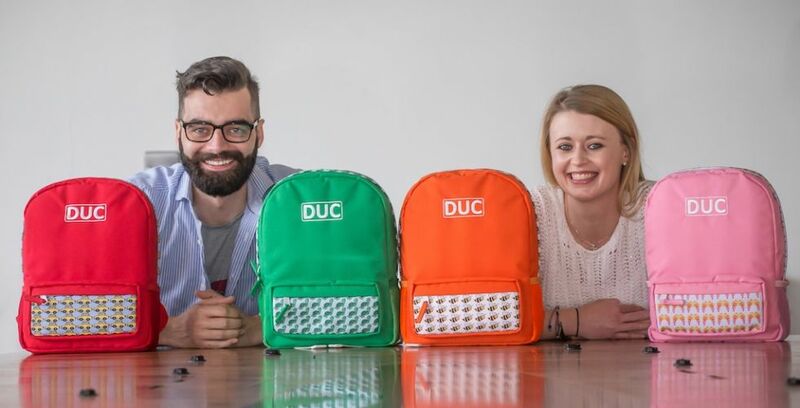 Anne Marie Greene (28) and her business partner Ian Kelly (26), who are both from Bray, launched DUC, a range of colourful junior bags, school bags and sports kit bags with the aim of creating opportunities for vulnerable Vietnamese children. Working in partnership with the Christina Noble Children’s Foundation, DUC – a shortened version of the Vietnamese word for education, giáo duc – is a one-for-one business model that pays for vaccinations, school kits, and local swimming lessons. Drowning is one of the leading causes of death among children in Vietnam with 32 children dying from drowning every day in the country. What inspired you to launch DUC? Ian and I are both Irish, Christina Noble herself is Irish too, so naturally, it grew organically from here. Was it difficult to get retailers to support your idea? No, it wasn’t, retailers like Arnotts and Mira Mira, have a tremendous sense of corporate social responsibility and our business model fit in with their CSR ethos. Of course, the fact that DUC doesn’t just donate a profit percentage to a charity but gives an actual tangible product to a child in Vietnam made it a no-brainer for a lot of the companies we approached. They have all been incredibly supportive of our venture and have become as passionate about the brand as we are. What was it like visiting Vietnam for the first time? Vietnam is such an incredible country, outside the city, the countryside is stunningly beautiful, and the cities themselves are vibrant and bustling. What I was unprepared for, was the level of poverty that exists. In the West, we are protected from this somewhat, while in Vietnam we were able to witness it. This experience played a huge part in the birth of the DUC brand; this is us trying to give back to this beautiful country, with friendly people that gave us such a pleasant experience but is scarred by war and poverty. We felt we could help the next generation coming through so that they could go on to help the country rebuild itself. 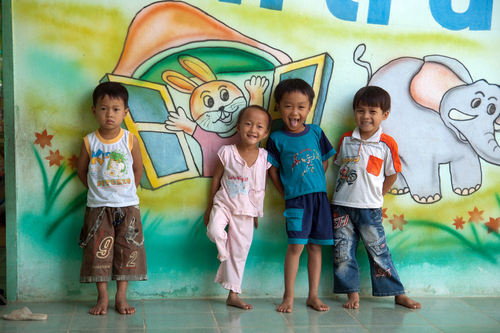 How can DUC improve the lives of children in Ho Chi Minh city? Simple. Education. Nothing can be achieved without education; it is the most powerful tool. There is little state support for parents trying to send children to school. Therefore, parents often choose which one to send. The Christina Noble Foundation aims to provide an education for all children. DUC partnering with that ethos means that we are helping parents to send all their children to school. The children can go on to start to be the change they want to see in the world. How do the monies raised by DUC help the children? This is the most important part of our business. Each range of bags has a purpose. The DUC Jr range focuses on vaccines. The level of child mortality is high. Each DUC Jr bag sold provides a vaccine for a child. The DUC school bag range focuses on education. 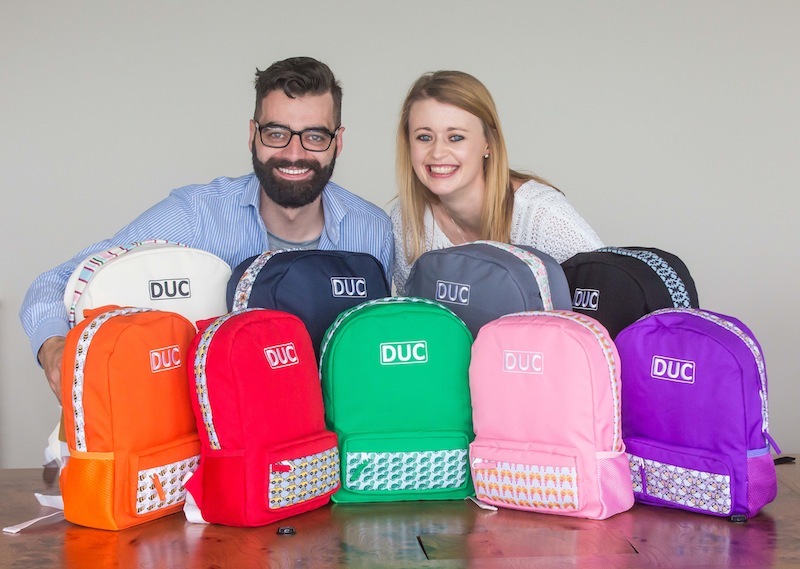 Education is not seen as a priority for families who are living below the poverty line so for every DUC school bag sold, an education pack is given to a child for school. The DUC sports range focuses on water safety. 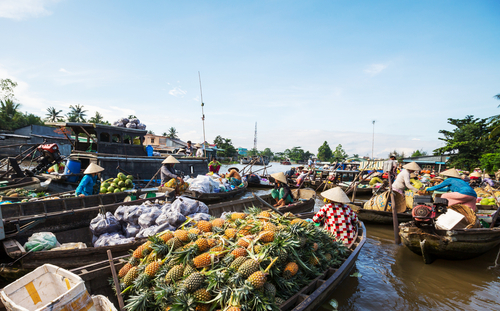 A lot of the poorest families live along the Mekong river, and shockingly 32 children drown every day so for every DUC sports bag sold, swimming lessons are provided for children, especially those living in high-risk areas along the Mekong. Essentially, all three ranges focus on giving children every possible opportunity to get an education and the tools they need to break the poverty cycle. DUC’s materials are sourced and made in Vietnam, how does the operation work over there? Vietnam has become a major international player on the global manufacturing stage, so sourcing a factory to come on board was not difficult. The facility we use has strict guidelines regarding the working conditions. We were careful to ensure that the plant we used would sit with our brand message. Ian has a background in design and made templates for the designs, and we both worked hard with the factory team. We are as passionate about producing a viable product as we are about the message our brand purports. There was a lot of too and fro, the time difference doesn’t make it easy. But we are delighted to have achieved our current range of products. You struck up a partnership with the Christina Noble Children’s Foundation, how have you found working with them? The work of the Christina Noble Foundation is staggering, and you only have to be in the company of any of the employees or volunteers for a matter of minutes to feel their enthusiasm and passion for the work the foundation does. They have been extremely helpful to us from the conception of DUC to its roll out throughout the country, whether it’s been brainstorming product ranges or working with their marketing personnel. They know we are as passionate as they are about changing the lives of children in Vietnam so working with them has been a truly inspiring experience. Did you seek any help, advice or funding from Irish organisations in the build up to launching DUC? 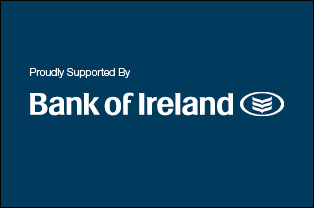 We have received no funding from any government bodies, but we have to say that the Bank of Ireland has been extremely helpful to us, giving business advice as well as promotional space in our local branch, so we are grateful to them for that. Ian has a business background, so that helped guide us but we worked tirelessly researching similar business models, sought advice from companies and retailers. We also received tremendous support from our friends and families who have also caught the DUC bug and have been working with us promoting the brand as much as possible. What are the long-term goals for DUC? Naturally, growth is our goal. The more our business grows, the more children’s lives we can change so the bigger we are, the better. We have a serious online platform and ship internationally, and we plan to contact distributors across Europe. We’d also like to crack the United States market but it’s important to us to have people on board that believe in our brand message. Watch this space. For more information visit DUC.ie. Ten brilliant Irish business ideas that changed the world.